A collaboration between myself, Spokane author Sharma Shields, and graphic designer Jean Pierre Greenlund, this piece was part of Eastern Washington University's "Get Lit" invitational art exhibit. 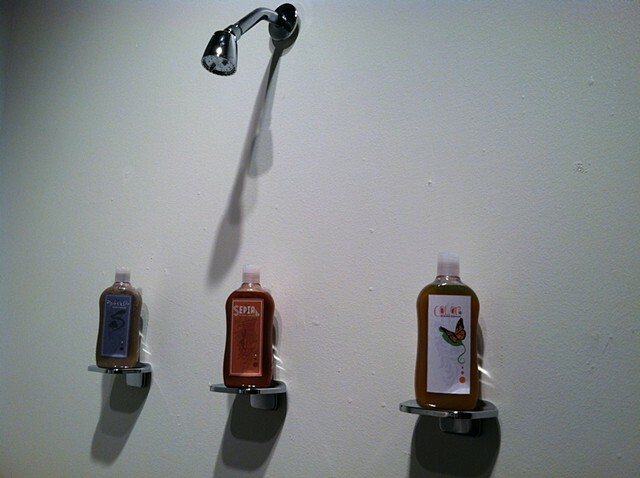 These 3 special shampoos have QR codes included on their labels linked to the stories of 3 fictional women. (http://spokaneessences.wordpress.com/) I used water from the Spokane River, Lake Coeur d' alene, and Hangman Creek to create these very personal shampoos. Local plant essences were used for unique fragrances. The process of the making of this piece particularly ecucational about the materials, the regional history of eastern Washington, and the women from this area.